Toward Expo’s end, I managed to work my way over to the TechRestore booth…where I then had to promptly pick my jaw up off the floor after seeing their matte-screen equipped MacBook Pro. 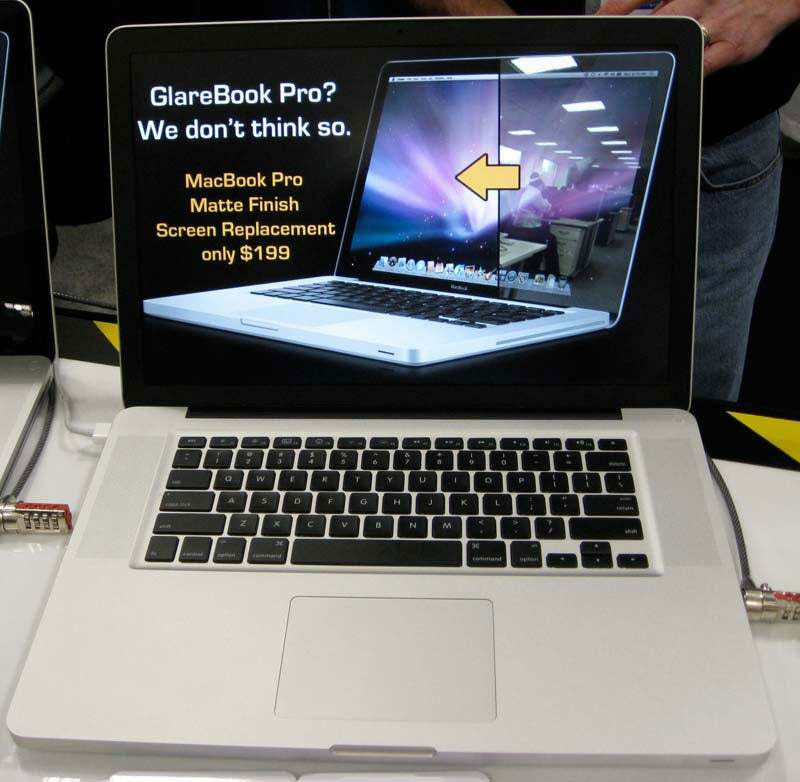 This is, quite honestly, the machine I feel Apple should have launched as the new Unibody MacBook Pro. The engineering of the new bezel (in a nice matte black finish) is perfect; it looks just as good as the one on the stock MacBook Pro machine sitting next to it in TechRestore’s booth. I took a picture (click the image to the left for a much larger version), but really, the image is somewhat disappointing because, well, because it looks just like a MacBook Pro should look. The picture doesn’t do justice to just how nice the machine looks; the flat-black bezel and matte screen look like they’ve been there since day one. The new screen is somewhat more flexible than the original—not surprising, given the support that was provided by the now-missing layer of glass. However, I compared it to my matte MacBook Pro, and the modified MacBook Pro certainly doesn’t flex any more than mine does. So if glossy bothers you a lot, as it does me, but you really really want a new 15-inch MacBook Pro (TechRestore told me it’s working on something similar for the 13-inch MacBook line), you might want to check out the TechRestore program. Sure, it’s more money than is an anti-glare filter, but the end result appears to be well worth the investment.